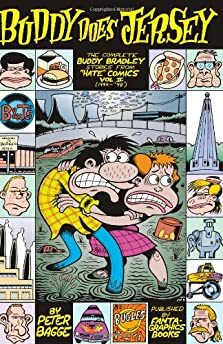 Buddy Does Jersey collects the New Jersey segment of Peter Bagge's Hate comics into one volume. As Buddy escapes Seattle to move back in with his parents in New Jersey, his life fills with problems. His parents are difficult, his brother is kicked out of the navy, his relationship with his girlfriend evaporates, and his business partner becomes increasingly erratic. Drawn by Jim Blanchard in crisp black and white, this volume follows Buddy as his personal life hits rock bottom. Through it all, Bagge paints Buddy's world with cynical humor that reminded me of the hilarious Johnny Ryan Angry Youth comics (not surprisingly, Ryan wrote the forward to this book). Buddy Does Jersey is easily the funniest book I have read all year with the least likable protagonist. Now I am looking for Buddy Does Seattle to read the beginning of this story. My next book is William Vollman's Poor People.